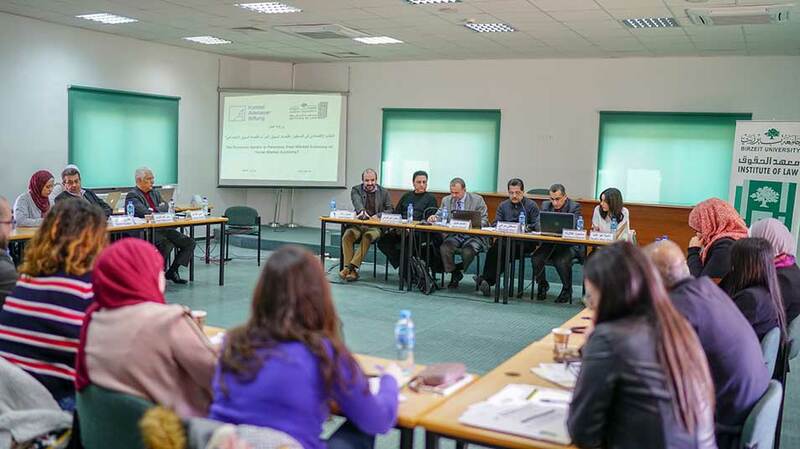 Legal experts, professors, and researchers delved into the legal aspects of the Palestinian economic system in a workshop organized by the Institute of Law at Birzeit University, together with the Konrad-Adenauer-Stiftung, on Tuesday, December 18, 2018. The first session of the workshop, entitled “The General, International and Comparative Framework of ‘Social Market Economy,’” was chaired by Asem Khalil, a professor of law at Birzeit University and the vice president for community affairs. Khalil said that the workshop is part of a research project undertaken by the Institute of Law to analyze the nature of social market economy systems and examine the extent to which such systems are connected to the legal apparatus governing the Palestinian economy. At the end of the presentations, a committee formed of legal and economic experts such as Firas Melhem, Naser Abdelkarim, Amir Khalil, Tareq Sadeq, and Samir Abdallah.